One thing that has always been important to me is oral health, caring for my teeth and gums. I’ve always been one to regularly brush my teeth as I dread the thought of ever needing dentist treatment, I’m happy with my annual check ups, in and out within 5 minutes! To help care for my gums I try to floss my teeth a couple of times a week, and when I keep it up I definitely feel that my teeth are cleaner and my gums are more cared for. I have however noticed around my top front teeth a permanently red inflamed area. The dentist just tells me to keep flossing it and massage the area with a soft toothbrush and it has never been raised as a further concern, but I find it very painful to floss between my front two teeth. If I leave it alone it doesn’t bother me and I forget about it until I see the redness in the mirror again. 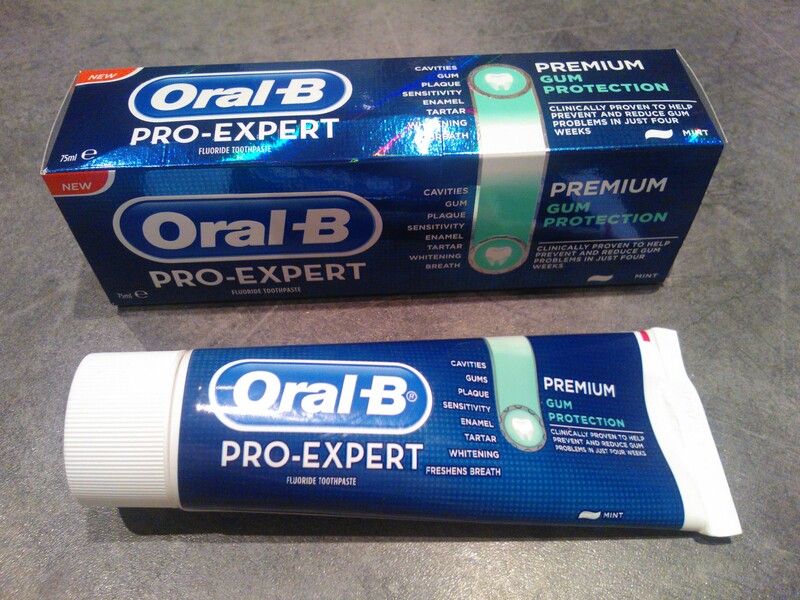 So I was keen to try the Pro-Expert toothpaste from Oral-B as a way of protecting and caring for my gums as I can see this is the area that may cause me further concerns in the future. The toothpaste offers premium gum protection helping to slow bacterial growth against gum problems as well as reducing plaque and fighting tartar. I found the toothpaste taste quite different to my usual bicarbonate of soda brand but was pleasant to use with a minty flavour. It did feel a little gritty rather than smooth but in a good way and left my mouth feeling fresh and clean after use. I look forward to seeing if there’s a difference to my top gum line after 4 weeks use as the box suggests. It’s interesting to hear that most people will suffer from gum issues at some point in their lives with it being the biggest cause of tooth loss. It can especially be an issue for women during pregnancy with 1 in 2 suffering from swollen, bleeding gums. Fortunately throughout my two pregnancies, I recall having slightly tender gums but nothing more. Let’s hope by making awareness of gum issues to everyone, that more people take care of them and fewer problems arise.